Announcing the Jedediah Shorts Sew-Along! On August 15th, in the full heat of summer, we will be starting the Jedediah Shorts Sew-Along. Set your sewing machine and lap-top up pool-side (or at least near a fan! ), grab an iced drink and get ready to make the perfect summer shorts! The full length pants version of the Jedediah Pants Sewing Pattern. For those who have never taken part in a sew-along before, here is how ours will work: We will begin a sew-along page on the blog where we will post, starting August 15th, three times a week. Each post will include photographs and explanations of several of the sewing steps involved in making the Shorts Variation of our soon-to-be released Jedediah Pants sewing pattern. You will have the option to follow along sewing your own shorts as we post each step or you can simply sew at your own pace as the posts will be compiled and kept accessible for you to refer back to. If you REALLY want to get involved, feel free to grab our Sew-Along button and post it on your blog. Just copy and paste this text wherever you want it! Also, comment on our blog with any questions or tips you might have throughout the sewing process…the more information and photos we can compile on our Jedediah Shorts Sew-Along page, the more valuable a resource it will be for sewers working on their own pants in the future! Throughout the sew-along, we will document each and every step of sewing up a pair of Jedediah Shorts. Now, by this point you might be wondering, “When will the Jedediah Pants pattern be released so I can get ready for the Sew-Along?” Very very soon! We have been working day in and day out on the extremely detailed instruction booklet…which we are both super proud of! We will have the pattern launched by the end of the month so you will have approximately two weeks to buy your pattern and supplies. In the meantime, you can start sending questions about the sew-along, the Jedediah Pants pattern, menswear sewing or anything else you would like to have addressed during the Question and Answer post – any question is fair game! 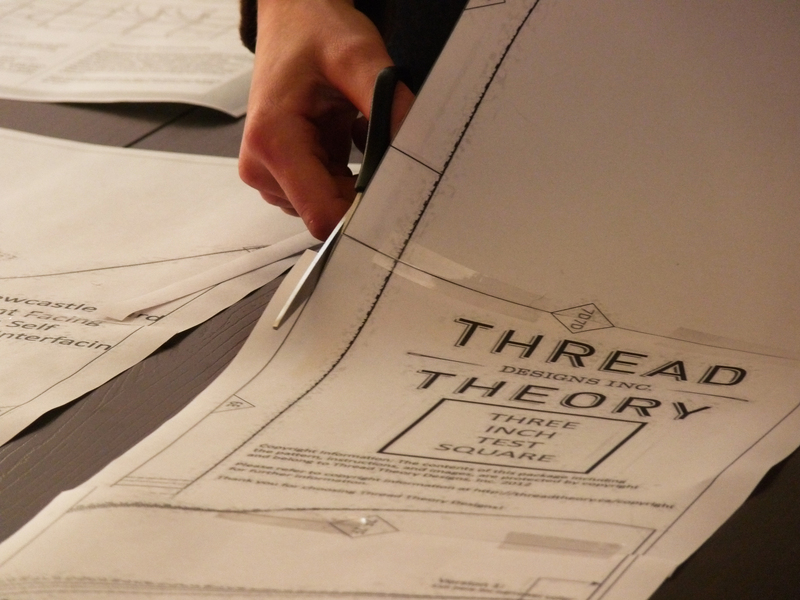 You can pose a question by leaving a comment on this blog post or emailing us at info@threadtheory.ca. Categories: Friday Posts, Jedediah pants | Tags: sew along | Permalink. Weren’t the ones Four Square Walls made awesome?! I was so happy when I read her post! I’ll have to check out NFAMH too 🙂 Thanks! I can’t wait! My husband has been asking for a pair of shorts and I keep making him pants. Too bad it starts on August 15, we will already be in our summer trip by then. But I will still join in after that! Count me in! I really need to learn how to make my own trousers. I’ve made plenty of coats and shirts, but never put in a zipper. Wonderful! We’re glad you’ll be joining us! Zippers aren’t as difficult as they’re made out to be…and hopefully the sew-along tips and photos will make the fly even simpler to understand than it would be on your own. It will be interesting to see how this compares to my Kwik Sew jeans pattern. The pockets are the biggest difference I notice. Your top-stitching looks great on your Kwik Sew jeans! As far as I can tell from your progress shots, aside from the pockets, the Jedediah pants are a bit of a slimmer fit in the legs. They have a smaller back yoke as well and smaller back pockets for what hopefully results (we think!) in a really modern look. I look forward to your blog post when you get a chance to sew them! I love your post on purple and pink sewing supplies! Matt and I are always complaining about that as well! What I would like is a really nice stitch ripper and with a wood handle…Matt is in the process of making me one right now! The back yoke is too big in the Kwik Sew pattern (IMO) so that’s good. I will certainly make some posts about your pattern when I work on it. Glad you enjoyed the post – having some wood tailoring tools would be cool. I saw your other post about the thread organizers your dad made. I thought about doing that too, but I ended up buying one because it was so cheap. I might make my own thread rack when I get more spools though (the one I bought is small). Ooooh! I’ll have to see how busy I am closer to sew along date, but I would love to participate! Fantastic! We are heading to NYC tomorrow on our honeymoon, so I will keep my eyes peeled for some fabric for my brand new husband! It will be winter here in Australia for the sew along but that won’t matter a bit! Very exciting! Congratulations on your marriage! Wow, I am so envious that you’ll be heading to the fabric stores in NYC!!! I can’t wait to see the fabric you find 🙂 Feel free to sew the pants variation for the sew-along if you’d prefer…there are not too many differences in the steps. Thanks 🙂 I’m glad to finally be joining the many bloggers hosting sew-alongs! 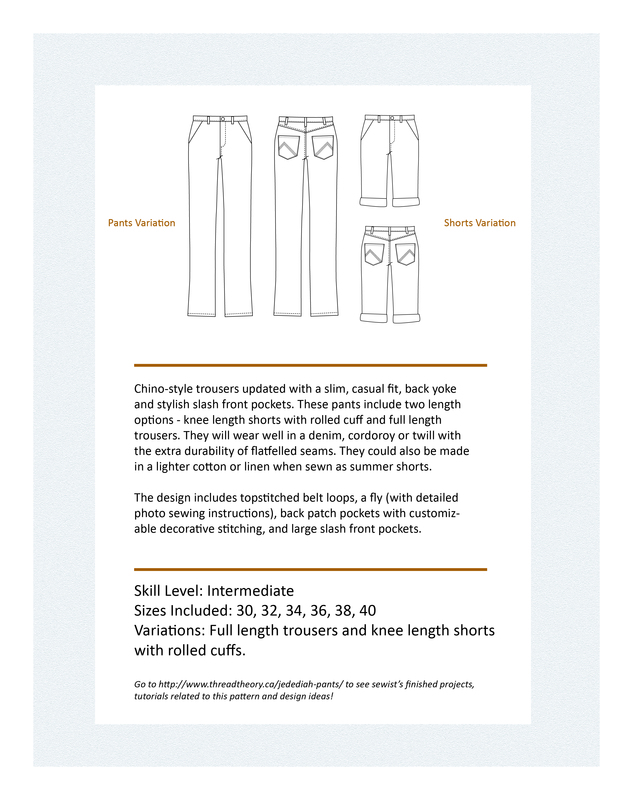 Feel free to sew along with us using the pant variation! There are not many differing steps – the main one is at the very end during the hemming process. yay! definitely count me in. very excited about this pattern! i’ve never done men’s shorts before, what approx would be the required yardage (sz 30)? I’m glad you’ll be sewing along with us! We will be posting a materials list shortly, but in the meantime (in case you need to buy fabric right away) you will be safe buying 1.7 meters or 1.8 yards of approx. 60″ wide fabric. Our materials post will explain ways to reduce this amount depending on your fabric choice. Have fun fabric shopping! I have a Big 4 mens shorts pattern I’ve been meaning to make for my boyfriend for ages now and keep putting it off because I’m too intimidated. I think I may have to flick that one and join in with the Jedediah Pants for the sewalong. Can’t wait! Sounds great! No need to be intimidated with these – we’re going to be adding sew-along steps in really manageable chunks with tons of tips and photos so even the fly will seem straight forward! Look fantastic. Are there any pics of the shorts version? There are now! We just posted some quick photos of the shorts (though slightly shorter and without the rolled cuff) on today’s blog post!